HERSHEY — With the way things are going for the Dallastown baseball team at the moment, almost nothing seems to bother the Wildcats. Not an early deficit. Not a Division I-bound starting pitcher opposing them. And certainly not the magnitude of a state playoff semifinal. 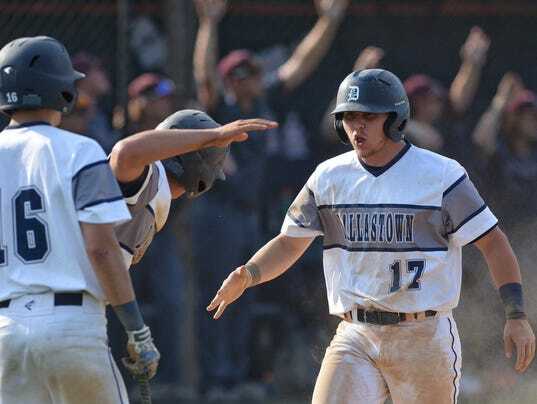 Even when all three of those challenges faced the Wildcats on Monday in the PIAA Class 6-A contest against State College, Dallastown thrived in the moment. Twice, the Wildcats scored three runs in an inning against the Little Lions, rolling to a 6-1 victory and advancing to Friday afternoon’s state championship game at Penn State at 3:30 p.m. The win was the team’s 20th in a row and moved its record to 23-4.